The web supplement to Fabien Reyal, Nicolas Stransky, Isabelle Bernard-Pierrot et al. This work was supported by the CNRS, the Institut Curie Breast Cancer program, the European FP5 IST HKIS project and Comité de Paris Ligue Nationale Contre le Cancer (Laboratoire associé). Dr F. Reyal and Dr I. Bernard-Pierrot were supported by fellowships from Ligue Nationale Contre le Cancer and N. Stransky by a fellowship from the French Ministry of Education and Research. 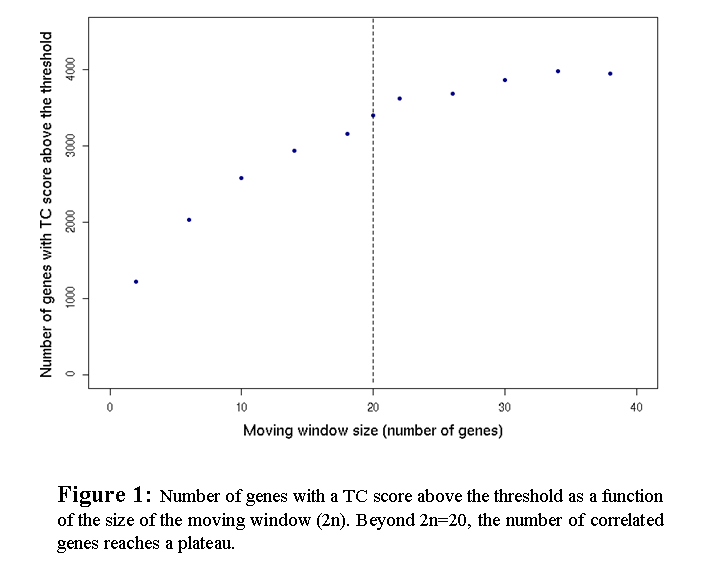 Number of genes with a TC score above the threshold, as a function of the size of the moving window (2n). Starting from 2n=20, the number of correlated genes reaches a plateau. 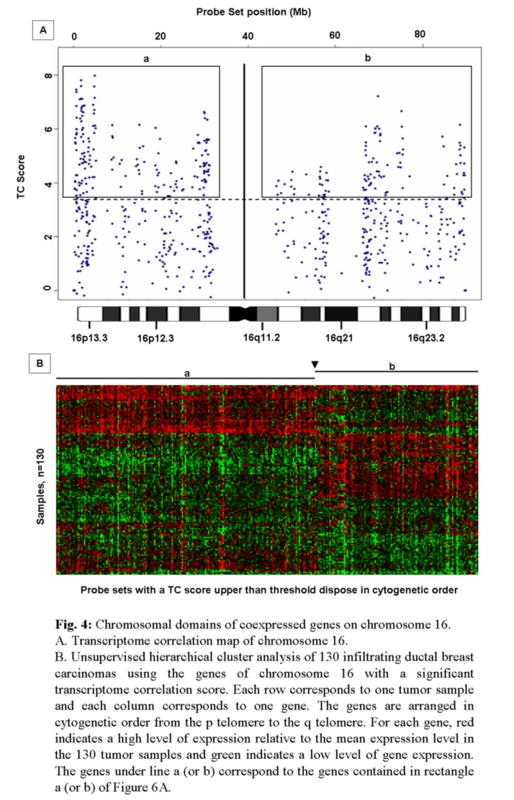 Transcription correlation map of 130 invasive ductal carcinomas of the breast, for chromosomes 1 to X.
Histogram of the gene densities among the genome (blue histogram bars), within 2 Mb slices. The histogram of the numbers of correlated genes (red bars) is superimposed to the gene densities and harbors a color shape proportional to the percentage of correlated genes among the total number of genes for each slice. It appears that highest percentages of genes presenting a significant correlation of expression with their neighbours, do not correspond to highest gene densities. Chromosomal domains of coexpressed genes on chromosome 16. Clinical data of the 130 invasive ductal breast carcinomas. Complete list of genes which TC score is above the threshold for the transcription correlation map of 130 invasive ductal breast carcinomas.